Mulgrew welcomes us to final DA school year. Discusses PD survey and large response. Says 61% have curriculum. 67% aligned with PD. Little support for ESL teachers. Special education marginally better. Insufficient CTLE PD. 72% have PD committee, up from 50. PD committee, 66% has meaningful input. 12% say superintendent determines PD. speaks of VA shooting. Says we cannot accept hate at any time, as rationale for violence. National—believes Senate will pass a version of health care. Says we will not have an issue in NY because we have great Senators, but perhaps they will pass something as they leave for July 4th holiday. Negotiations at night in secrecy. Says person occupying White House now calls House bill mean, but says Senate bill is full of heart and passion. Betsy DeVos—says he thinks she should be on TV every day. Let her talk. This would be a great campaign. Let people see what Sec. of Ed. stands for. Once again, she keeps saying it’s up to state whether they want to recognize civil rights. It’s actually illegal, and he hopes people recognize. Janus fast tracked. We assume US will become Right to Work country, and we think it may happen early 2018. State—Mayoral control—introduced bill for charter accountability and transparency. Press only wants to talk about mayoral control. Mulgrew would trade nothing for mayoral control. Says he doesn’t support this version of mayoral control, but supports mayoral control. Says 40 school boards preclude great education and proper funding. Heastie says every year there are “self-governing” issues all over the state. They are all passed by Assembly, which supports local control of local governments. When they ask what we are doing Mulgrew said this is a bunch of crap, because we’re the only county that doesn’t get our local control issues. Rest of state works by different set of rules, has to pay price for what it wants. No longer about mayoral control, but rather precedent that NYC has to pay for its local control issues. Speaker has said he is now not passing any other local issues. If mayoral control sunsets, next May it will go back to school boards. This will be big fight. Doesn’t matter what version of mayoral control because it appears nothing will get done. If they don’t respect NYC autonomy, Assembly won’t respect other local autonomy. If we don’t get something done there will be 40 school board elections and charters will also be active. Our position is NYC should be treated as all other municipalities. Regents—We will go from three to two days of testing in grades 3-8. Consultants lost. Pushed back on standards. Board of Regents directs education, and wants work done on ELLs, preK, and special ed. It is a lot of work, due to our advocacy. CTLE—will be summer training. DOE now approved vendor, but not doing it yet. We’re doing a summer training, will increase number of instructors. Also for paras. One more day to enroll for catastrophic insurance. Over 8,000 enrolled. Recommended by Welfare Fund. DOE diversity plan—happy it’s recognized, but plan will not be very helpful. We will have further discussion. ATR severance package—we have contractual provision, we are always trying to negotiate and have got it done. Have sent out to ATRs. Believe it should be quite helpful. 900 eligible of 1100. Not easy, DOE didn’t want to do it. Believes there will be significant changes in this pool by this time next year. Severance is not pensionable, but if you retire you still get retro. Mulgrew suggests we all have a party with beer. Is greeted with great enthusiasm, but no one follows up. Decided not to focus on pursuing skirmishes school to school, and rather to look at systemwide improvements. We will continue individual fights but we want to picket superintendents. We agree with the mayor that schools should strive for supportive, respectful and safe environments. We need to hold supes responsible for doing jobs with principals. City not doing job. We have anecdotal evidence but at this time of year we have data, had conversations with field staff. Picked one superintendency in Brooklyn. Supe contracted UFT borough rep, had horrible meeting. Lack of info between supe and team. At next meeting borough rep got everything she asked for. Supe acted differently as chancellor was in room. Data was irrefutable. Created team with chapter leaders to meet as advisory committee. Tenure decisions come this year. What is criteria? Is it about whether supe likes principal or not? Have said there was evidence of that and will move forward. Said supe behavior has clearly been modified and we have ways of fixing things if they move back. We can always picket again, but we want to first implement agreement. High schools there no longer mandated to use balanced literacy. We had data and an irrefutable case. This gave us ability to make change. We used DOE data. They denied it and we told them it was their own. We hope to move everything this way next year. Year Roundup—Says it started election day. Was a wake up. Doesn’t know if we would’ve accomplished our goals but election day showed we are now at forefront of fighting for public ed. Not perceived but real threat. Says it’s time to get over depression. Everyone here figured it out and started moving. Participated in women’s march. We then got introduced to Betsy DeVos, made inroads in her hearing. Most well-known Sec. of Ed. in US. We will continue to battle with her. DeVos budget horrendous. Showed at state level what we were facing. We brought in folks from Michigan, who presented to legislature of NYS. Budget showed protection of public ed. NYS said this is what you do with public ed. We introduced chapter advocacy program, and pushed paperwork process. We had 313 complaints. 93% were resolved in our favor. Whoever used it knows no principal wants supe to know what happens in their school. Those resolved centrally were not good for those below. Thanks Debbie Poulos. Teachers got 4.5% increase in May. Constitutional Convention vote coming next year. City Council budget—presented to them on teacher’s choice. Asked for 20 million, and got 20.1 million. Number should be in excess of $200 per person. Community learning schools—results are off the charts. We got 2 mil from state and 1.5 from City Council. Proves solving poverty means coming to UFT. 15 PLC schools. Changed culture, trained everyone. Custodians, cafe staff, everyone comes. Changing culture reduces suspensions. Next year Constitutional Convention, Janus. Will see what comes from feds. Student achievement and grad rate higher than ever. We want city and state to protect us and allow us to thrive, and we have achieved our goals. We will still have fights. We will still have to modify behavior of those in middle management. Endorses beer idea. Thanks counselors. Eid recognized, schools closed June 26. Reminds us to set up committees, complete SBOs. Mentions catastrophic insurance. Mentions Hometown Heroes, collaborative event to commemorate educators. Asks for nominations. Says you can nominate principal if you have great working relationship. Wishes happy summer to all. CL—Just got excessed with four others there for over 16 years. Last year, principal said was drop in enrollment. Has dropped by half. Had thought they were safe. Excessed because of salary increase from raises, said principal. Says her budget office told her she had to max out every classroom and everyone else had to go. At some point in future, can we achieve goal of lowering class size? Can we put lowering class size back on table? Mulgrew—already on table. We want and tell NYC we have to lower class sizes. That principal told you that means I have to hear from superintendent what she thinks of that. We will look at budget and find things that need to be cut. Class size piece always front and center. We have this some places because of gentrification. We have to deal with this. Lots of teachers are embracing mobility. If we are going to have drastic changes, major drop in population, we may need a different system for mobility. Other districts exploding. May have to look at more flexible transfers. CL—Praises Mulgrew. Summative conferences happening, but many teachers haven’t gotten all observations. What is recourse if principal didn’t do job and rating not good? Mulgrew—Have to document. Next year is first year of matrix. Matrix is our friend. Waiting to see results. If you haven’t had required number of observations, you have to document it. This is why committees are mandated. 60% of schools in one superintendency didn’t do required applications. CL should report to DRs. CL—If Janus goes as we expect, what happens to benefits, grievances, will I check list when people ask for help? Mulgrew—Depends a lot on decisions. What you get in benefits from Welfare Fund is more than you get in dues. What if benefits are withheld? Will depend on SCOTUS. Q—Many staff members receiving D, not happy. 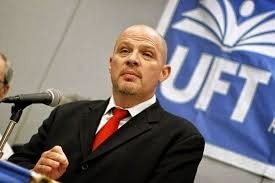 What is their right, what is UFT doing to help? Mulgrew—District 3 has precious superintendent. We are pulling data. Want to see what else is going on in school, in this district. One member has developing because he couldn’t service ELL kids in his care, but his class had so many different levels it would meet educational neglect level. Asking principal and supe what they are doing. James Eterno—Resolution for vote on ATR agreement, meetings and votes for ATRs. Reads, cannot motivate as it is for this month. Endorsements—Paul Egan—various city council candidates. Jonathan Halabi—New Action—Given what happened in November, people have been strategizing on preventing Trump agenda. We need to be at forefront locally. One candidate, Fernando Cabrera, doesn’t share our values on hate. Key funding from far right orgs. They know who’s most open to those suggestions. On charters, not clear, open to funding things we’d oppose. Open to funding private schools. Boasts he is social conservative, and district is conservative. Worst is he is a homophobe. Believes, preaches, and came back from Uganda, praised jailing gays and lesbians. Not good enough when we know what is in his heart. We know there is real danger of hate, not because he voted wrong, but because he is not with us. Marjorie Stamberg—When endorsements come up, we have to stop thinking in terms of individuals and think in terms of class. Democrats can’t fight Trump. We need union movement. Eliu Lara—Disagrees with Jonathan, says he’s not homophobe. Says he spent 18 years as counselor. Says he approves. Halabi—Point of order—asks for separate vote on Cabrera. Contingency Resolution—Paul Egan—Asks for Exec. Board to endorse during summer. Solidarity with AMPR—Evelyn de Jesus—Puerto Rico suffering. Hedge funds want money. Board wants to get paid first, worry about island later. Says AMPR, sole bargaining unit, has reached out for support. Asks for support. Peter Lamphere—Moves to amend—asks to insert FMPR. Evelyn correct AMPR bargaining agent. Is more than one agent. FMPR led strike, and is reason PR doesn’t have charters. Entire leadership was fired. DA voted in solidarity with them, would like to extend this solidarity. LeRoy Barr—Rises in support of resolution, against amendment. Says we support all workers. PR under devastation, and all need our support. We have only endorsed this group because they came to us via AFT. National level comes via AFT. This group worked with AFT and disaffiliated. Group does not have right to bargain for PR teachers right now. We’re gonna fight on behalf of injustice. Asking we do not allow res to be amended by something that violates our own process. Let them go back to AFT and get approval.